The sudden presence of an unusual volume often precedes a big move in the stock. When you see heavy volume which is more than the average trading volume, you should take note. Stocks seldom do nothing when heavy volume is present. In my observations, 99% of stocks tend to have a big move within a few months from when the unusual volume occurs. Usually you will see volume that is 3 times, 5 times and even 8 times more than the normal average volume. For example, if the stock normally trades 2 million shares and you see a volume spike to 10 million shares that day, then that is unusual volume. Is the stock near support or resistance? Has the stock just begin a new uptrend? Are there bullish or bearish reversal candlesticks forming? Did the stock gap up or down? Let's take a look at some examples and see how unusual volume affect stocks. In the chart above, you can see how Colgate had a big gap down in late January 2017. It was a very big bearish gap with an unusual volume of at least twice the average volume. 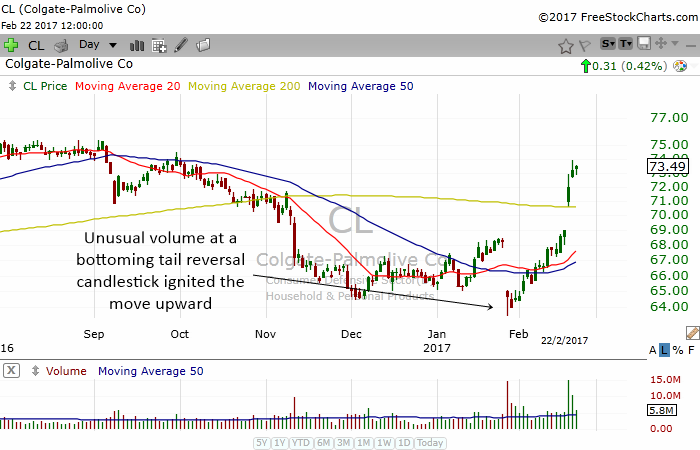 But the candlestick pattern that formed at the end of the day is a bottoming tail which often signal a bullish reversal. When you look at the weekly charts of Colgate (not shown), the stock was near a support area. When you combine all these analysis, you can make an educated guess that the unusual volume is probably going to benefit the bulls. The direction that the heavy volume will work for is to the upside. 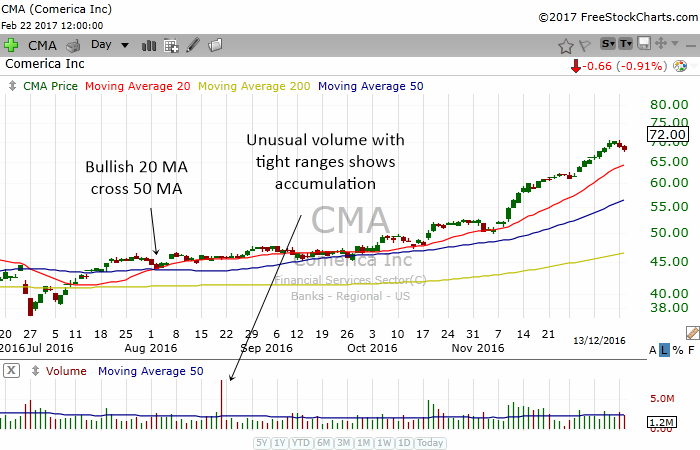 In the chart above, you can see how CMA entered into a new uptrend when it went above its 20,50 and 200 MA. The stock also had a bullish 20 MA cross 50 MA which hinted of a bull uptrend. The stock traded at a very tight range and had an unusual volume on one of those days. The heavy volume hinted to us that some one was accumulating the stock. The stock continued to trade sideways for awhile without doing anything. Then all of a sudden a very bullish move happened. Stocks that experience unusual volume sometimes do not move for a while. Sometimes, they may take a few months before they begin their big moves. Despite this lag, there was someone out there that knew that this stock was about to explode higher. This someone is probably a large institutional investor who bought this stock in anticipation of a big move to the upside in the coming months. 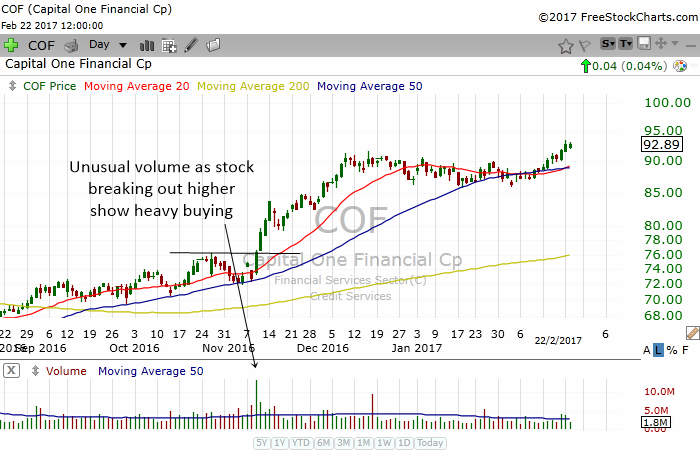 In the chart above, you can see how COF had unusual volume as it break out above a trading range. This heavy volume told us that the move upwards is supported by a lot of buying. Some very smart people knew that the financial service sector is going to shoot up higher and therefore they bought COF. When they see the breakout, they immediately jumped in to purchase the stock in anticipation of a higher move. Whenever a stock that is in a downtrend exhibits unusual volume or gaps down on unusual volume, you can be very certain that a bearish crash is likely to happen to the stock in the coming months. 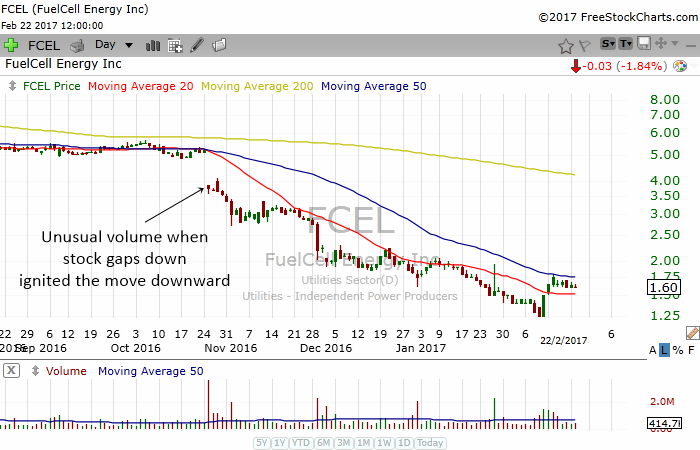 In the chart above, FCEL was already in a very bearish mode because it was below its 20,50 and 200 MA. This is a sign of weakness. Then, one day in gapped down on unusual volume. The heavy volume showed many holders of the stock selling. This ignited a move downward and the stock continued to drop to around $1.60. 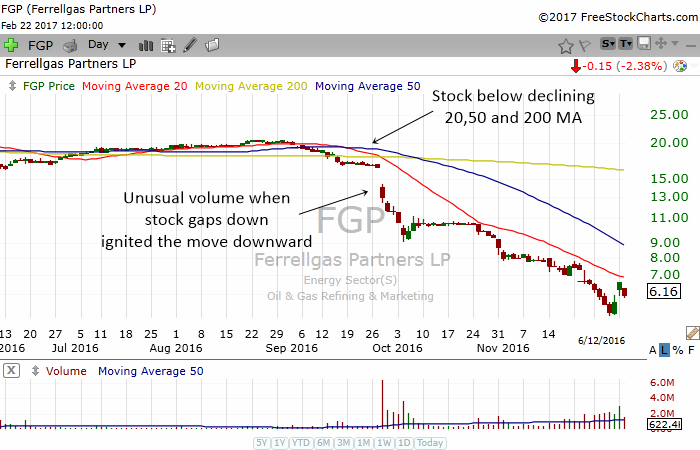 FGP is another example of a stock that was already experiencing a very bearish environment. The stock was below its 20,50 and 200 MA. It traded sideways for a while but then it gapped down on very heavy volume. This ignited a move downward and the stock lost more than half of its value in just 2 months. Unusual volume analysis can also be done on weekly charts. When you see heavy volume on a weekly bar, this often show that something serious is going on in the long term health of the stock. 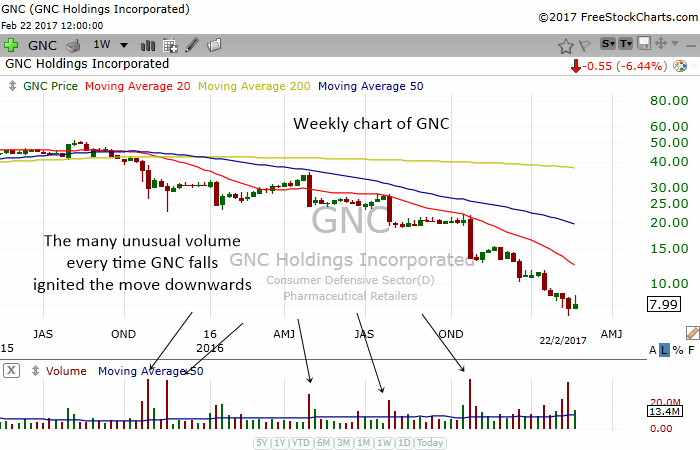 GNC was in a very bearish mode because it was below its weekly 20,50 and 200 MA. As the stock dropped, there were many unusual volume down weeks which tell us there were many people selling the stock. Its was therefore not surprising to see this stock drop from $50 to $7.99.